Pepper Lim continues his series of letters to his future grown up daughter. There are certain foods the Muslims cannot like pork. To determine if a food is halal or not, many food products have the halal logo on them to help Muslims. These logos can only be put on a product once JAKIM certifies it as halal. For instance, long ago, the packet of jelly mix contained animal gelatine (which could be made from cow or pigs). To ensure the jelly was halal for Muslim consumption, one need only look for the halal logo on the packet. To which the husband replied, “Mana saya tau halal ke tak? Tak ada chop halal,” and proceeded to leave the shop. When it was my turn to approach the counter, the shopkeeper looked at me and I told her that I too did not understand why the Malay man thought chocolate was not halal. Have some Muslims taken the halal rule too far? Just two months ago, the Ministry of Health (MOH) announced that certain bars of chocolate from Cadbury contained traces of pig DNA. “Health Ministry confirms pig DNA detected in two Cadbury chocolate samples” (24 May 2014). This raise many eyebrows. Since when have chocolate manufacturers in Malaysia used pig products? More interestingly, how did MOH determine the pig DNA since every living organism on this planet share very similar DNA. Humans have 90% similar DNA with chimpanzees, 70% similar to some fish, 65% similar to chicken, 47 % similar to fruit flies, 24% similar to grapes and 18% similar to yeast! It is my understanding that there is a very long process to determine the presence of a certain DNA in anything. In any case, the pig DNA in Cadbury chocolates sent some Muslims into a frenzy! Never mind that they did not actually consume the tainted chocolates themselves, Malay groups ISMA, Perkid, PPIM and Puhm still came out to declare a jihad against Cadbury. A jihad! A holy war against a chocolate maker! 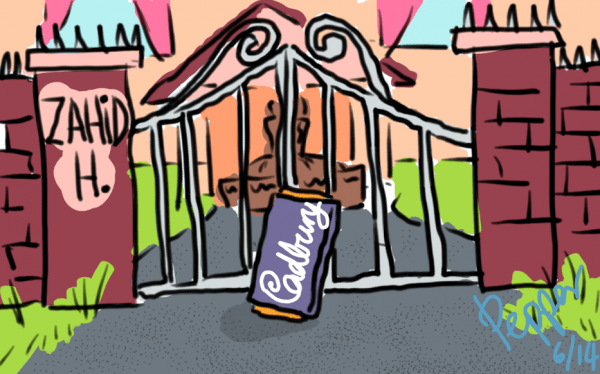 They wanted Cadbury to pay for for a sort of dialysis to clean their now tainted blood. They do not realise, when you consume food, it is processed in your stomach and its nutrients are transferred to every part of your body. It is not just the blood that needs cleaning. They even went as far as to blame Cadbury for the many woes facing some Muslims. Another Muslim group, JMM, said they would sue Cadbury on behalf of all Muslims for RM100 million. A few days later, the consumer affairs ministry (KPDNKK) threatened to jail and fine shops that continued to sell Cadbury chocolates regardless of non-Muslims who are not affected by pig or any animal DNA found in chocolates. We made it to the world’s headlines again that month. All the major news agencies picked up the story and ran with it. As if our country was not already in a very bad light after flight MH370 went missing without a trace. A few days later, JAKIM announced that there was no pig DNA found in Cadbury chocolates. All the parties who had screamed jihad simply slunk away without so much as an apology. Even the MOH did not apologise for its mistake. After that incident, I started to think. 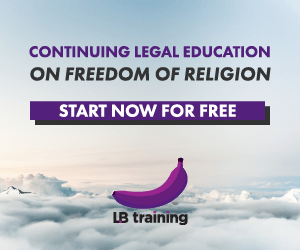 How did we get so hung up on halal certification? Since when have we been taught not to think for ourselves but to let others do our thinking for us. In the case of the Muslim couple in the first story, why didn’t they think for themselves to determine if chocolates are halal instead of looking for a halal logo on it i.e. letting JAKIM do the thinking for them? When I was a boy, people used to meet anywhere for a meal. Today, you cannot find a Muslim in a Chinese coffee shop. In the old days, our Muslim friends would eat at Chinese coffee shops but simply order pork-free dishes such as chicken rice, popiah, satay or chee cheong fun. The Malay lady replied, “Don’t worry la. When I ate it, I did not know it contained pork and you did not intentionally feed me pork so I am okay.” She even joked about how delicious the char koay teow was! That was back when I was a boy. There was a time when Muslim friends attended a party or open house, the host would simply point out the dishes that contained pork. No one made a fuss. Everyone ate and enjoyed themselves. Nowadays, it seems, Muslims will get offended if pork dishes are served at a Chinese New Year open house. Some Muslims say it is disrespectful to them when they are invited to a party that serves pork. So, for fear of disrespecting or angering Muslims at a Chinese New Year open house, no pork is served. Never mind the Chinese traditional dishes and culture. Well, what about Hindus who are invited to a Hari Raya open house? Is not beef rendang a traditional Malay dish served during the celebration? Why is it all right to serve beef dishes which is haram to Hindus? What about vegetarians? Are we disrespecting them when we invite them to our party and serve grandma’s delicious chicken curry with roti jala or home made assam laksa? And what about guests who are allergic to seafood? Can you imagine the kind of food you will need to avoid if you plan to invite your friends to your open house? You cannot serve pork dishes for the sake of your Muslim friends, no beef dishes for the sake of Hindu friends, no fish for those allergic to seafood, oh wait, scratch off all the meat dishes for the sake of your vegetarian friend. Don’t serve vegetables either because some people say they are genetically modified and contain pesticides. So, only serve plain water at your open house to celebrate Chinese New Year or Hari Raya or Deepavali or Christmas and no one will be offended. Our group looked at one another. “Why?” we asked. “Because some Muslims will not buy unless there is a halal logo,” he replied. “But water is just water. There is nothing in it but water,” I said. I do not know whether to laugh at the Muslims who refuse to think for themselves over the halal’ness of a bottle of water or at JAKIM for actually giving a water company a halal certification. With that, I guess now you cannot even serve plain water at your open house too! Another thinking Muslim is Aunty Azira Aziz. 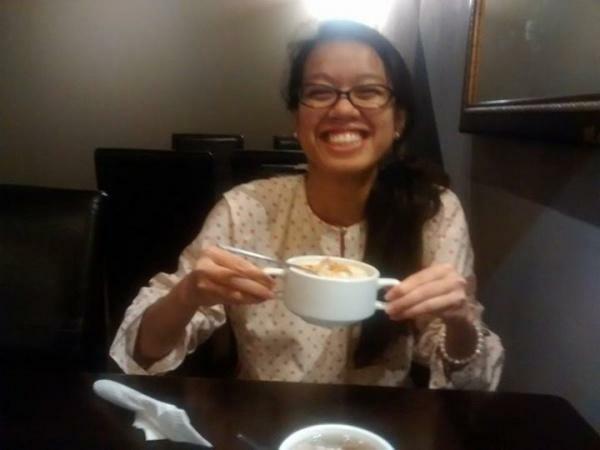 She once met me at a non-halal restaurant when I called for friends to raise a mug of Tiger beer for the Tiger of Jelutong who passed away suddenly in an accident. 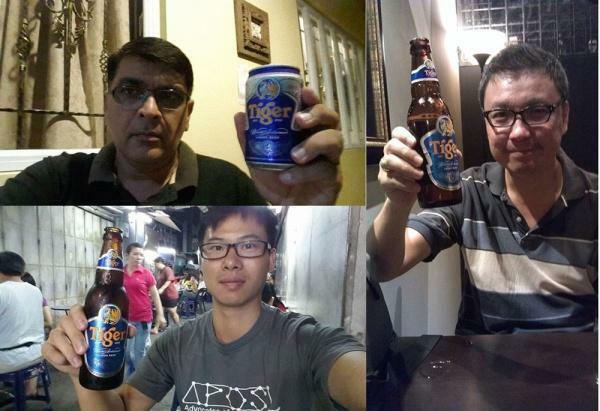 We had Tiger beer while Aunty Azira had mushroom soup. She did not complain that we were drinking beer in front of her, nor did she make a fuss that the pot used to make the soup might have been used to cook pork or that some pork might have accidentally gone into the soup. She happily had her soup with us. Why don’t we go back to the good old days when everyone celebrated our diversely rich cultures and embraced each other’s traditions? For example, at a Chinese New Year open house, just serve all your family’s traditional dishes and label them for your guests. Let each guest choose what and what not to eat. Posted on 10 September 2014. You can follow any responses to this entry through the RSS 2.0. Never let anyone do the thinking for you. And never use an example that you barely know yourself. Halal is not all about pork only, fyi. I am sorry to say that I read and re-read this article very carefully and I was unable to see a "halal" logo anywhere. Therefore, I am not sure if I should have read it. Great advice of general application. Never let anyone do your thinking for you.